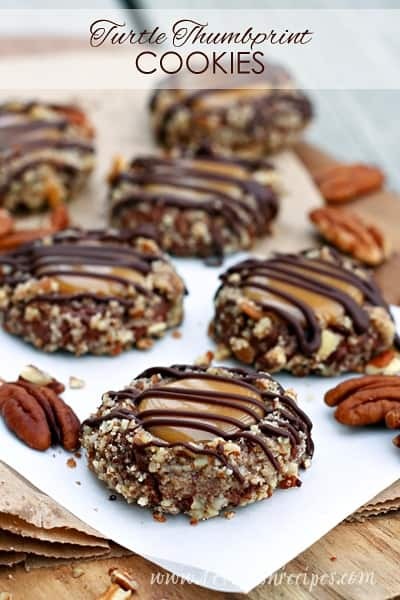 TURTLE THUMBPRINT COOKIES — Delightful chocolate nut thumbprint cookies with a caramel filling and chocolate drizzle. 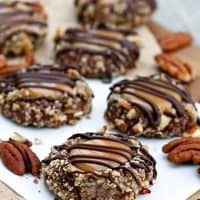 I’ve seen these Turtle Thumbprint Cookies here and there around the Internet, but for some crazy reason, I never got around to trying them until now. I don’t know why I waited so long because they are fantastic! I mean, there’s a little pool of caramel in the center. What’s not to love about that? It would not be an exaggeration to say that these shot straight to the top of my must make Christmas cookie list. Besides all that caramel, I love that the dough isn’t too sweet. I find that a food processor is the best way to finely chop the nuts, but I’ve also used my blender with good results. With a drizzle of chocolate, these cookies are as pretty as they are delicious. I always double the recipe. With five of us, a single batch wouldn’t last a day! Be sure to save this Turtle Thumbprint Cookies recipe to your favorite Pinterest board for later. Delightful chocolate nut thumbprint cookies with a caramel filling and chocolate drizzle. In a medium bowl combine flour, cocoa, and salt. With electric mixer on medium-high speed, beat butter and sugar until light and fluffy, about 2 minutes. Add egg yolk, milk, and vanilla and mix until incorporated. Reduce speed to low and blend in flour mixture. Cover dough and refrigerate for one hour. Whisk egg whites in a bowl until frothy. Place chopped pecans in another bowl. Roll chilled dough into 1-inch balls, dip in egg whites, and then roll in pecans, coating evenly. Place cookies about 2 inches apart on a lightly greased baking sheet. Using a 1/2 teaspoon measuring spoon, make an indentation in the center of each dough ball. Bake for 8-10 minutes, or until just set. Meanwhile, microwave the caramels and cream together in a small bowl for one minute. 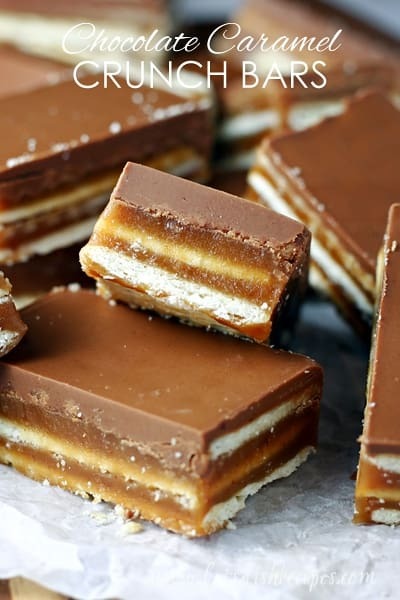 Stir and return to the microwave in 20-30 second increments, until caramel is melted and smooth. Once cookies are removed from the oven, gently re-press the indentations. Fill each indentation with about 1/2 teaspoon of the caramel mixture. Cool on the pan for about 10 minutes before transfer to a wire rack to cool completely. Prepare the Chocolate Drizzle (optional). Place chocolate in a small zip-top plastic bag. Set bag in a bowl of warm water to soften. Gently knead the chocolate with your fingers until melted and smooth, placing back in the warm water for a minute or two as needed. Alternately, chocolate can be melted in the microwave at 50% power. Snip a small corner from the bag and drizzle chocolate over cookies. Who Dished It Up First: Adapted from The Kitchen is My Playground. They look great! I love Christmas time – it offers the perfect excuse to bake large amounts of cookies and use a lot of butter. 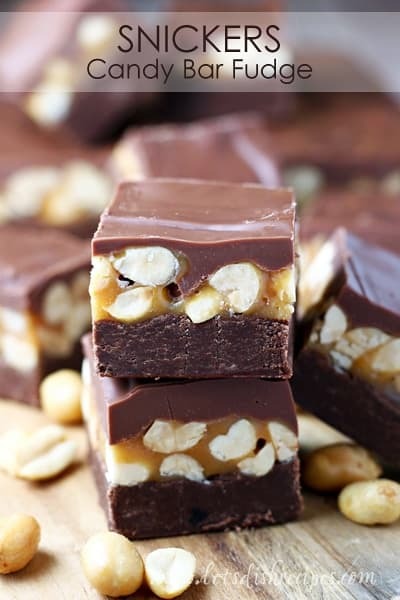 Thanks for sharing the recipe – I love the combination of nuts and caramel. The photo is making me hungry! I love these cookies! Thanks Danelle. 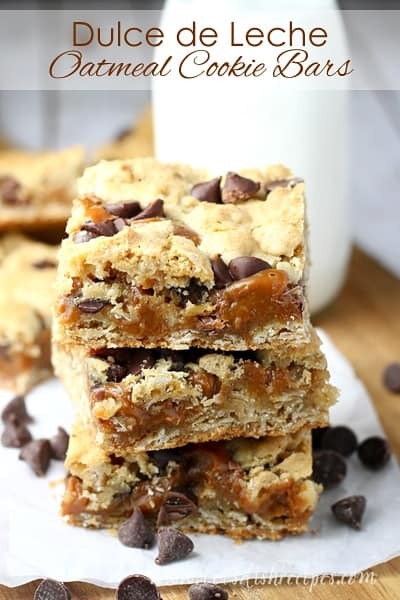 These look so delectable, Danelle. They’ll have to go on the holiday baking list for sure! How much shortening for the drizzle? I found your recipe/blog via the 30+ Festive Cookie Recipe round-up post. I made these earlier this week, and I just wanted to let you know– SO GOOD!!! Scrumptious, in fact! I am totally making them again for our family holiday party. Many thanks for sharing this recipe! These are the perfect little cookie to make for Christmas! I was thinking of making some of these up to put in little gift bags as part of my Christmas baskets I give out every year. Thanks so much! Great recipe. My issue is the spreading. My balls spread out and lose their form. Maybe its the oven ? I pretty much had to make an indention on a thin cookie which didn’t work out well….. Tasted great just didn’t meet my expectations … How to avoid ? I have not had problems with mine spreading too much. You do have to remake the indentation after baking though. But they shouldn’t have been too thin to do that. Maybe try a bit more flour or a little less butter? Thank you! I love the whole pecan idea. I’ll definitely give that a try! Yes, they can be frozen, for a few months. Do you measure the pecans before or after they are crushed? all purpose flour or self rising? I just made these and they came out perfect! Thank you! Tomorrow I’m getting more caramels to make more for my cookie trays. A keeper. Pecan half suggested seems like a great idea to try too. I made these and they were great. I used dark cocoa since that is what i had and had to substitute caramel filled Hershey kisses for the caramel filling. They were amazing. Had to hide them from myself.